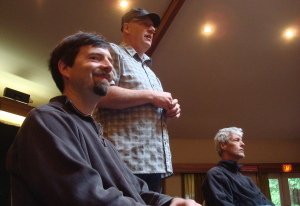 In late May I went on an excellent music retreat for Stick® players, organized by Jim Meyer. 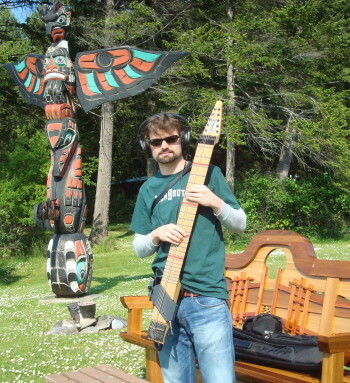 I heard about this annual "Stick Retreat" about a month after receiving my Chapman Stick. I thought that going on this trip would be an excellent opportunity to assimilate into the Stick/tapping community. I also loved the idea of taking a nice vacation to British Columbia (Canada). 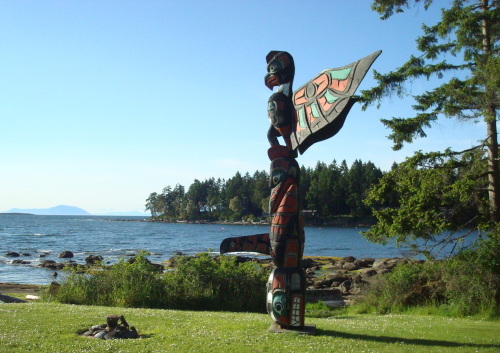 The retreat was to take place on Gabriola Island, which is a small island off of the west coast of Vancouver, near Vancouver Island (contains the city of Nanaimo) from 5/26/11 to 5/30/11 (taking advantage of the long Memorial Day weekend for us Americans). 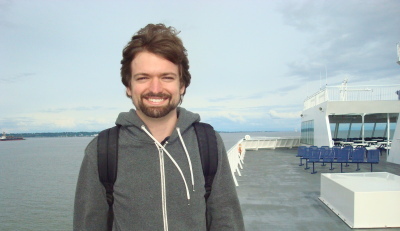 I arrived on Gabriola Island after getting onto a smaller ferry from Nanaimo. It was quite a journey just from the airport to the The Haven (the retreat accommodations). I didn't realize until arriving there that The Haven is a place that people usually go to for emotionally-therapeutic activities. I assure you, us Stick players were just there to learn and to enjoy playing music (we left our emotional baggage at home, haha ;). That said, I have to admit that I didn't mind the unbelievably-relaxing atmosphere. :) The campgrounds are breath-taking. Oh, that green! It is so refreshing. Living in Southern California my whole life (which is a facade of a paradise: it's actually a gigantic desert of urban sprawls, lacking trees), I really appreciate seeing green. It is so good on my eyeballs. Green, where have you been all of my life!? As you can see from the photo, the trees come right up to the water. I found this to be the scenery characteristic that I would explain to people most when I got back home. So, on to the music part of this story. :) Our host, Jim Meyer, is a Vancouver local. Jim is a super-nice and super-talented guy. He invited Greg Howard and Bob Culbertson to be the primary instructors (besides himself). What a combination: Greg and Bob are some of the top Stick players and instructors on the scene. I had seen Greg in person briefly once at NAMM, and I got to chat with Bob and see him perform at Stick Night in December 2010. A special treat was that Kevin Keith showed up at the retreat, as both an instructor and participant, as well! :) I had happened to first see some of his YouTube videos the night before I left for Vancouver, so I was especially excited to meet and to talk with him in person. It was a nice surprise. Kevin is such a talented musician and an all-around great guy. I picked up his "this is EJE" (EJE = "Electronic Jazz Ensemble") album and I've really enjoyed listening to it. I really dig the synth drums played by a human (that human being David "fingers" Haynes). There are 2 YouTube videos (#1 #2) that demonstrate how remarkable the "electronic" aspect of EJE is. The instruction of the retreat consisted of group lessons for most of the day, along with a private lesson with one of the professionals. On Friday, I attended the beginners class, led by Greg. Bob led the advanced class. On Saturday, I mostly-attended the advanced class, led by Greg (and sometimes Jim). Bob was leading the beginners class that day. Friday's beginners class was definitely slow-moving, but with being so new to playing the Stick, I wanted to get as solid of a foundation as possible for my playing technique and approach to the instrument. Greg's class definitely provided that. Saturday's advanced class provided more of the challenge that I needed. We learned some catchy bass lines and grooves, played exercises for hand independence, and went around a circle trading blues solos. 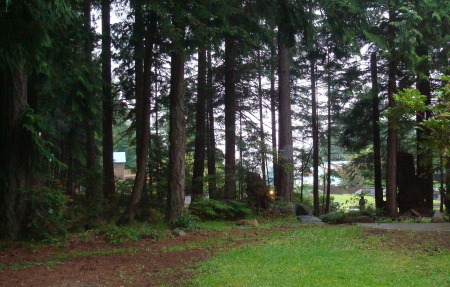 One of the most enjoyable parts of the retreat for me was an outdoor rhythm exercise that Greg led us in. Initially, we stood in a large circle on the rocks of the shore. Next, Greg set a pulse by stepping left, moving his right foot to touch his left, then stepping right, moving his left foot to touch his right. Now that we were all stepping in rhythm together, Greg would clap out a rhythmic pattern with his hands that we would clap back at him. I felt like I was participating in a work song, and I liked it. :) There was a nice sense of "tribal connectedness," if you will. It was a good bonding activity that allowed us to get some fresh air, exercise, and enjoyment from the nature that we had the opportunity to be in. 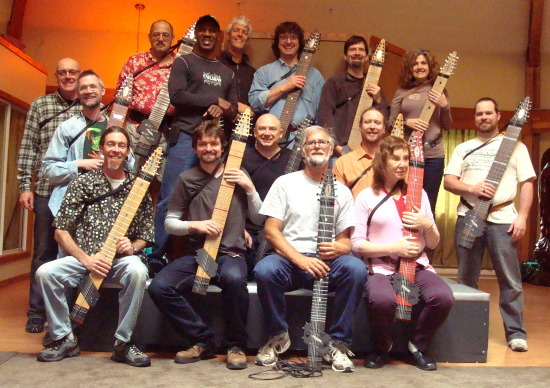 On Friday night, Jim organized a "Chapman Stick Concert" at the Haven Theatre. The performers were Jim, Bob, Kevin, and Greg. The format was nice: each performer played a few tunes before the next one came on. There were a total or 3 or so rounds. 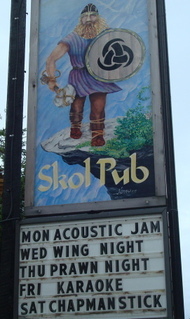 The Skol Pub sign: so epic. On Saturday night, we hosted another concert. 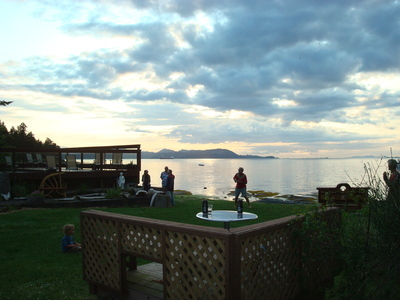 The location was "Skol Pub", which is right on the coast of Gabriola Island, next to the ferry dock. The concert also included the aspect of "open mic" for any of us students that wanted to try performing in front of others on our Sticks. 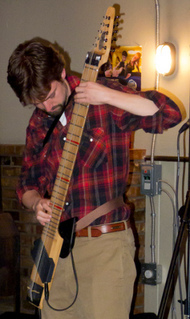 This was a chance for me to try playing this new, strange instrument in front of others. A lot of the pub was filled by our Stick people, but a fair amount of locals were also present, enjoying the brew and the music. For my performance, I had a small set list in mind. I would perform 3 pieces each just manageable for me, from different genres : "Kings of the Beach", "Apache", and "This Land Is Your Land". "Kings of the Beach" was a small medley based on the chiptunes from the 1990 NES video game: track 3 (the options screen with the beautiful bikini babe) and track 5 (the invigorating fanfare played when switching sides). "Apache" is a Shadows surf rock piece from the 1960s, which I was exposed to via the cover recording by the Ventures (there is also an excellent YouTube video of the Ventures performing this piece in more recent years). My goal is to play what the electric bass is playing with my left hand on the Stick and to play what the electric guitar is playing with my right hand. Finally, "This Land Is Your Land" is the well-known American folk song. In this piece, I use a technique that I'm working on in the left hand. During my ~7 minutes of fame, I definitely made a good deal of mistakes, but it was a valuable learning experience. Wow, Canada was awesome. I am so glad that I went on this trip. This was the best vacation that I have been on to date. Last day of leisure: playing frisbee at "night"